We provide support only through our support desk. Register yourself in our site, then active your theme in this page. After this here you can find a “themes” section that contains the url of the sample data that you can download, a list of videotutorials availables and you can also open a ticket to get support. AsifMajeed: Im a complete beginner, had no clue about what I was doing or even where to start, but my passion for this theme made me buy it and I have no regrets. It comes with a detailed step-by-step from begining to end and the support is so fast and so good. I have no complaints at all, extremely satisfied, couldn’t be happier. I highly recommend this theme! webtoday2: Just want to say not only is this an amazing theme, but the support is simply second to None! After years of being online and using a variety of themes, imagine having a question and someone actually answering quickly to help resolve your issues. No worries here about making a purchase and waiting days to hear back from someone. They really do have an excellent team on board to help you with any questions you may have. Couldn’t be more satisfied with my purchase. Many thanks to you for a great theme and wonderful support! chongsm2867: Sara, not only is the theme awesome, your support is equally awesome too! You and Mustone (tech support) have been spot on in answering all my technical questions. For those who are still undecided, this must be one of the best WP ecommerce themes that is well supported by a group of dedicated staff. 10/10. meanmugstore: I just wanted to let everyone know what a great theme this is. I started using Wordpress a few months ago and purchased a theme that ended up being poorly coded and the support was terrible (WP Flexishop 2). I was very frustrated and decided to give the Mayashop a try. I can honestly say that it was the right decision. Mayashop is solid, very well coded and the support is outstanding. Proper support and correct coding makes all the difference in the world and I had to learn that the hard way. Don’t take any chances like I did, buy the right theme from the start. They won’t leave you hanging! thesportbasket:Hi Sara, I just wanted to give you and Nicola high praise for all of your timely help with all of my issues & questions as I worked my way thru setting up my website over the past month. I have to say, I am very impressed with the both of you and absolutely LOVE this theme!! I have absolutely no experience designing websites, and the fact that I fnished and am now up and running, is an amazing feeling and is ALL thanks to you guys!!! You 2 are the best!! Youngseekers: A couple of weeks ago, I bought this theme and I ‘ll be the first to admit that I was a pain (in the you know what) because I had a client from hell who was driving me nuts with a million requests for customization. That being said, this is an AWESOME theme! Installing it was a breeze and once I had access to the support forum, I was able to customize the site as much as I wanted. So to Sara_p and all the other great guys at yithemes.com please accept my heartfelt apology and KEEP UP THE GOOD WORK. 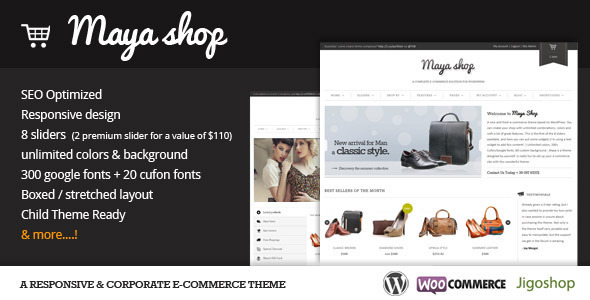 wowstyleshop: Thanks for this awesome and totally versatile WP WooCommerce Theme. After working with it for a while, I am happy to say that I would always buy this again! The support is simply phenomenal and more than willing to help, even when I asked if it was possible to add a certain functionality to the theme. All questions were promptly solved within MET timeframes. Thanks yiw and keep up the great work! 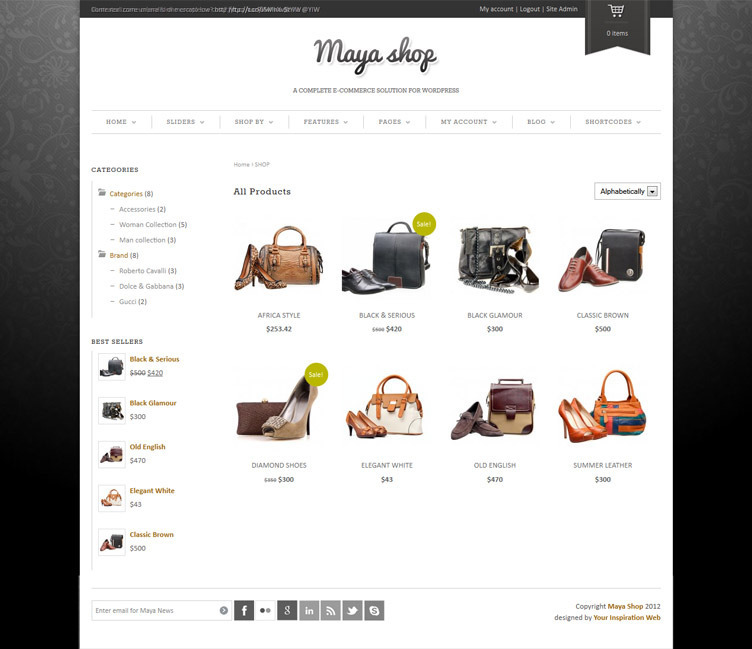 mayaotraya: Very cool wordpress ecommerce theme, easy to manage and offering plenty of possibilities to be personalized. A great team behind this theme ready to help and resolve all troubles. chaismeyer: I need to let everyone know that support is out of this World! Even though they’re on holiday right now, they jumped in to fix a problem I had with SSL. Thanks a bunch support team! I’m definitely a fan! franki: I’ll tell you, I’ve worked with MANY developers and you are by far the most helpful group I’ve ever come across. Each day I see dozens of new support requests at your support forums but you manage to not only reply quickly, but resolve every one within hours! How do you do it?? You’ve earned my respect and future business. Please keep it up. Thank you! eddiewill9: The support service these guys provide is simply amazing. Can’t recommend them highly enough. They have helped me through a handful of issues (usually due to my inexperience) and solved all of my issues quickly and professionally. Incredible level of service on a 60.00 purchase! doamore: A great theme, but what is really helping me is the great forum support. Sara_p, nicola, and antoscarface have been extremely helpful. Thank you support team for a great theme and great help. 5 stars! lf2: These guys deserve respect because it’s such a nice theme and so easy to edit! I can honestly say this is the best theme for wordpress out there on this moment ( i used more then 30 premium ones) 5 STARS ! Blackboxav: This is easily the most user friendly and feature packed eCommerce theme I’ve used to date. Simple to customise and it looks really great, clean and modern. Even better is the support you receive on the forums, I’m yet to have a query that wasn’t dealt with quickly and best of all, in a friendly manner! Will certainly look at your themes again for any future projects! HollyAmelia: Really enjoying this theme but love the support more. The support and forum are fantastic and extremely helpful even for beginners. Worth every cent. Thank you so much! silentfxx: PHENOMENAL job on the theme!!!! It is a very well thought out and built theme!!! and the SUPPORT you guys provide to EVERYONE that has bugs and questions is just AMAZING !!! 5 STAR RATING !!!! En2011: This theme is absolutely first-rate! The attention to detail in the design, back-end, documentation and support forum is amazing. This theme was definitely worth the investment and stands out way above a lot of the other products here! Christina: I’ve Purchased 2 themes from this Author and both themes are ROCKIN ! As if that wasn’t enough they go above and beyond when it comes to support and always respond within hours!THANK YOU ! Masideas: Great theme and great support forum!! Good work!! Gran plantilla y gran foro de soporte!! Muy buen trabajo!! ze_design: I just want to say that this is the most Awesome, Professional and “Clean code” theme that I’ve purchased from Theme Forest! Keep up the great work! danielV: Hey I’m super excited to have found this epic theme! Just spent $100 on a programmer to try and make the woo commerce plugin fit my other theme and it was a pure mess. Your theme really comes with EVERYTHING I could’ve dreamt of!!! Robthijs: The theme is a dream to work with, great job! sofiapedroso: Fantastic template, with one of the most beautiful sliders i have ever seen. Great integration with woo commerce. Great support. Great job. Congratulations. 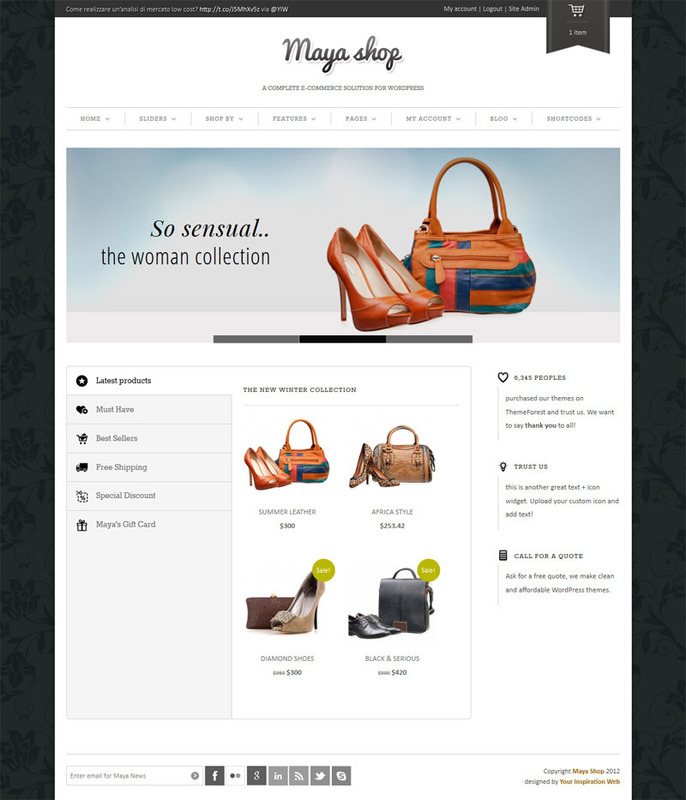 audieswu: Hi Sara, Just wanted to say MayaShop is the complete solution for any Wordpress hosted e-commerce site. Your support staff is superb! Scarfi and Nicola are the most responsive support staff I have ever dealt with. You made a life-long customer out of me. I look forward to YIW future theme releases. JakeBJake: Hi, I want to share my opinion about MayaShop theme. I’m newbie, I did not make a websites and do not know how to write code for website, etc. I was looking for the ready-to-use store, a simple site, affordable, etc. 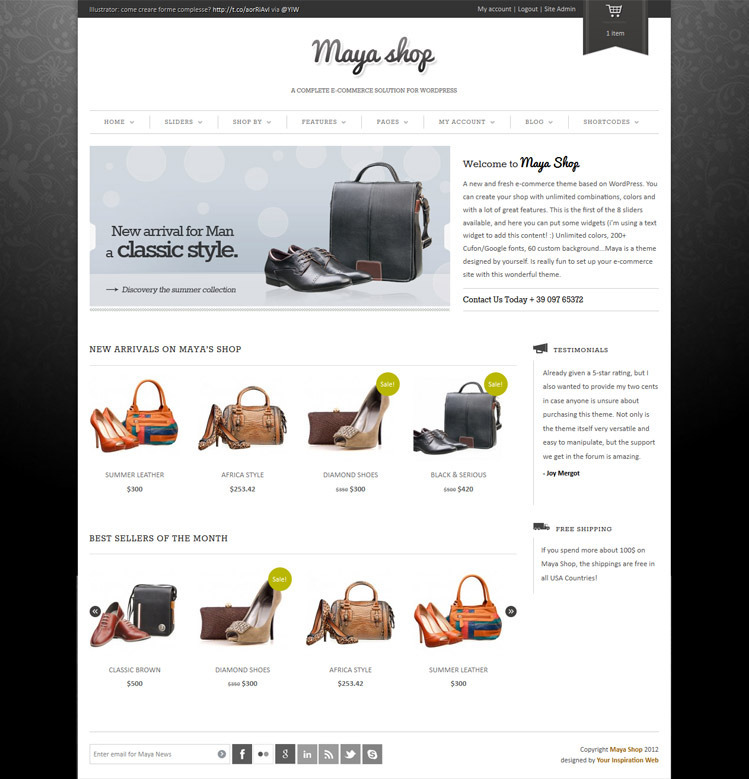 I read a lot of reviews, rankings and chose MayaShop theme. When I bought MayaShop and I logged in to support.yithemes.com and then I saw a huge help given by People from MayaShop. INCREDIBLE! Step-by-step show how to set page (video) and a lot of hints. 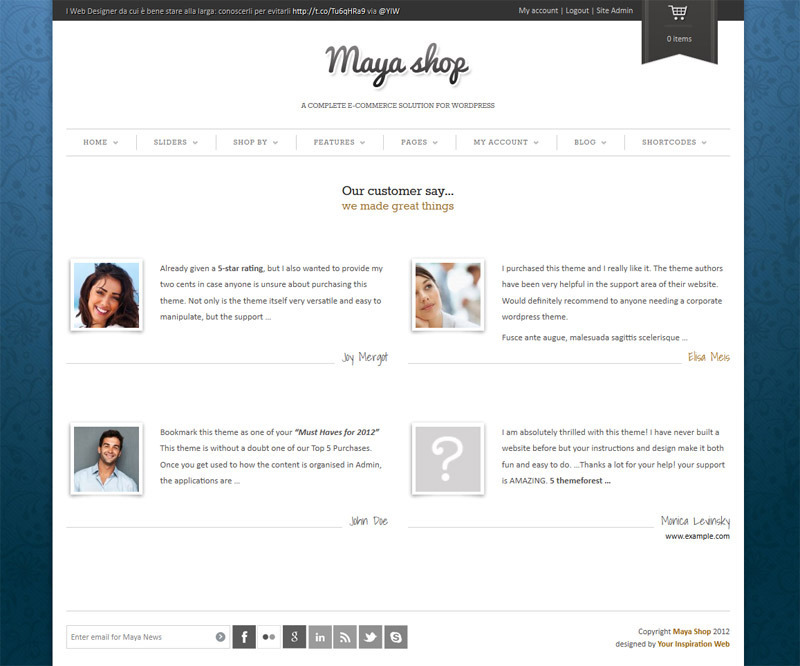 MayaShop has many additional features that you can use if you want to or not. I was afraid that the purchase will be left alone (I’m newbie) and I would be looking for support on the forums, and I would not find at Sara_p. Until today already sent 3 questions (tickets) to MayaShop support. Maybe, the questions I sent were trivial problems for the MayaShop Team, but for me they were huge NOTE! I have never waited for a response for more than 24 hours! Replies were exhaustive subject and patient (!) like for those newbie I am Thank you for your help and support – THIS IS A GREAT! I bought second MayaShop theme:) I RECOMMEND MAYASHOP! eddiewill9:The support service these guys provide is simply amazing. Can’t recommend them highly enough. They have helped me through a handful of issues (usually due to my inexperience) and solved all of my issues quickly and professionally. Incredible level of service on a 60.00 purchase! garage604: I’ve bought a lot of themes and this is the best response and customer service I’ve received on theme forest. The Dev and staff are always there to help, even responded on weekend. decarodesign:I agree with everyone. Your team does provide outstanding support, and issues happen all the time with theme, plugin, and even wordpress upgrades. I am so impressed how quickly your team responds upgrades and resolves the issues so quickly. I will certainly purchase more themes from YIT. Customize your product’s thumbnails: colors, borders, shadow, turn on/off add to cart and detail buttons, edit colors, choose if display the name of the product inside or under the thumbnail,....and more! Added: Yith Woocommerce Wishlist 2.0 *note you must remove embedded wishlist to use it. Fixed: Social share issue when there are no product description. Fixed: Search Form wrong position on header for 960px resolution. Added: More socials in blog section. Option in ThemeOptions -> General -> Blog Settings. Fixed: Add to cart button now appear also if there’s not price.